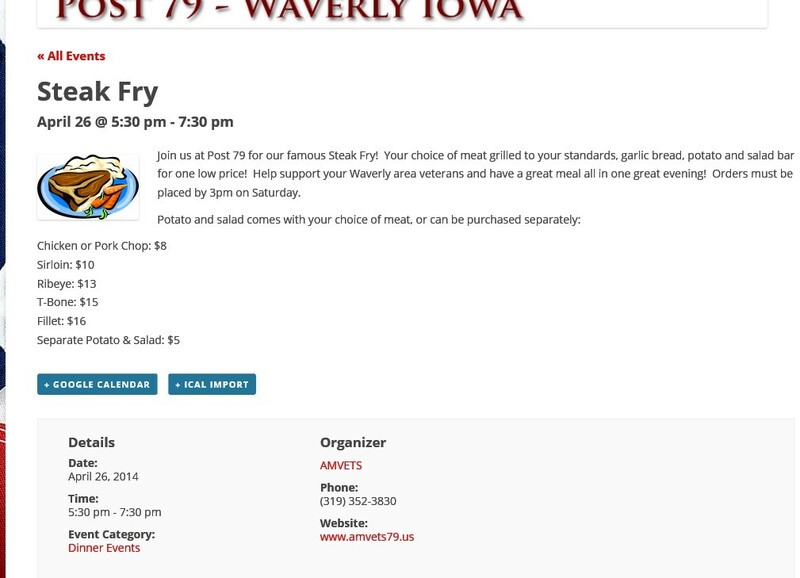 Welcome to the Waverly AMVETS Post 79 webpage! If this is your first time visiting, allow us to familiarize you with some of the new functionality contained within its design. The new AMVETS website (as of April, 2014) was designed to modernize and consolidate much of the information from the old web site, making it easier to access from any page on the web site. The menu system remains at the top of the site, no matter what page you happen to be visiting. The first thing you’ll notice, is the menu system. As noted earlier, content from the old site was consolidated using menus and sub-menus, and some new content was added. On the new AMVETS page, you will note the menu items across the top: Home, About, Tributes, Membership, Gallery and so on. These are the primary menus of the new site. All of these items are “clickable” and will take you to other pages. In addition, we have made use of Sub-menus. Sub-menus are additional content links which can be seen by hovering your mouse over a menu item. When you hover your mouse over a sub-menu item, it will turn greyer than the sub-menu, letting you know which item you are going to click. Sub-menus contain all sorts of information that can’t be added to the primary menu due to space restrictions. 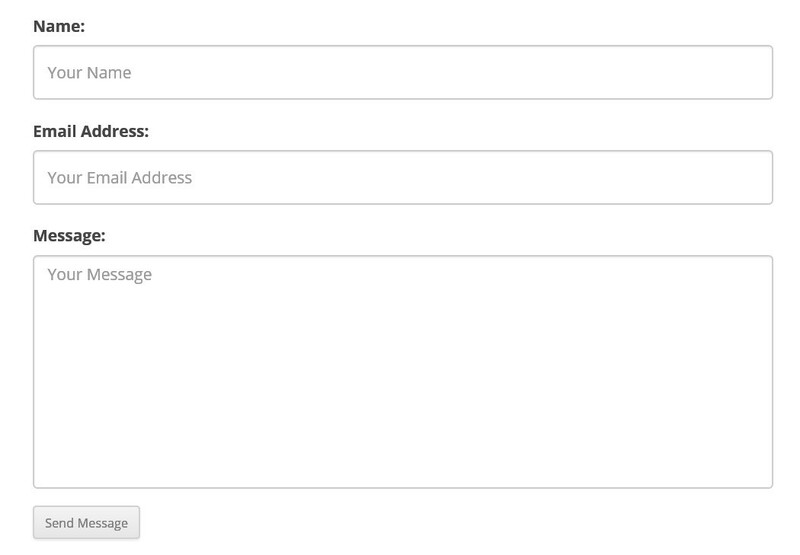 So, in our example above, if you were to hover your mouse over the “Home” menu item, you will see the above sub-menu. 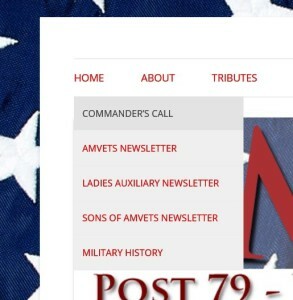 Clicking on “Commander’s Call”, will take you to the page with the AMVETS commanders notes. In this way, we can add more content to the site, with less time looking for the links. 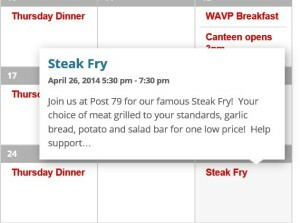 Many of the menu items have sub-menus, including: Home, About, Tributes and Contact. Feel free to try them out and familiarize yourself with the locations of all the information on the site. In Memorium is a special place on the site, where we honor those who have recently passed. Hovering your mouse over “Tributes” will bring up this sub-menu option. Clicking on the “In Memorium” link will take you to the In Memorium page, where obituaries of our honored loved ones can be found. Once there, you can click on any of the names of the deceased to view their obituary. Clicking on the “Gallery” menu item will take you to where pictures can be found. Available pictures will be listed on the page, and clicking one of the pictures will bring it up in a slide-show pop-up window, called “Lightbox”. To move to the next picture, simply move your mouse over the picture to display the left or right arrows. The left arrow will take you back to the previous picture, while the right arrow will take you to the next picture. The “X” at the top, will close the lightbox window. 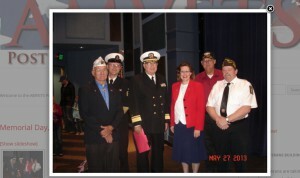 The web site makes use of a contact form, which allows you to contact the AMVETS regarding any questions you may have. Contacts have been listed for the various organizations, but if you have a question for someone other than the listed personnel, please feel free to fill out this form. 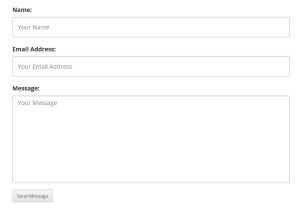 Information required on this form are name, email address (so we can reply to your inquiry) and your question or comment, which should be typed into the “Message” field. 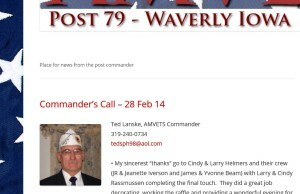 Once finished, click “Send Message”, and your question or comment will be delivered to the AMVETS webmaster who will distribute it to the right person to answer your question. 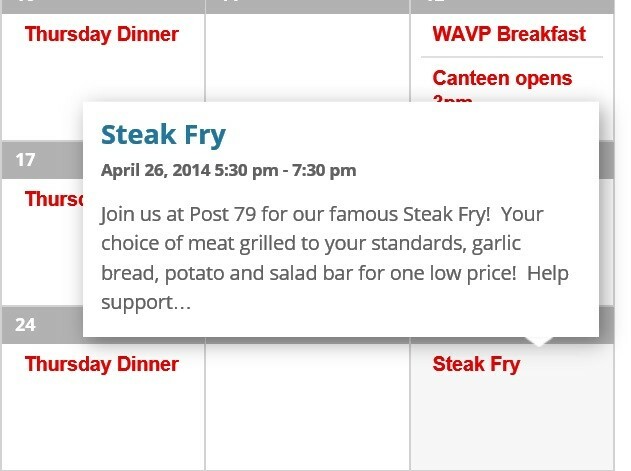 The calendar is much more than it was on the old site. In the past, the calendar was a simple picture, which only displayed the events by their name, just as if you had hand written an event on a calendar. With the new calendar, many more options are possible. 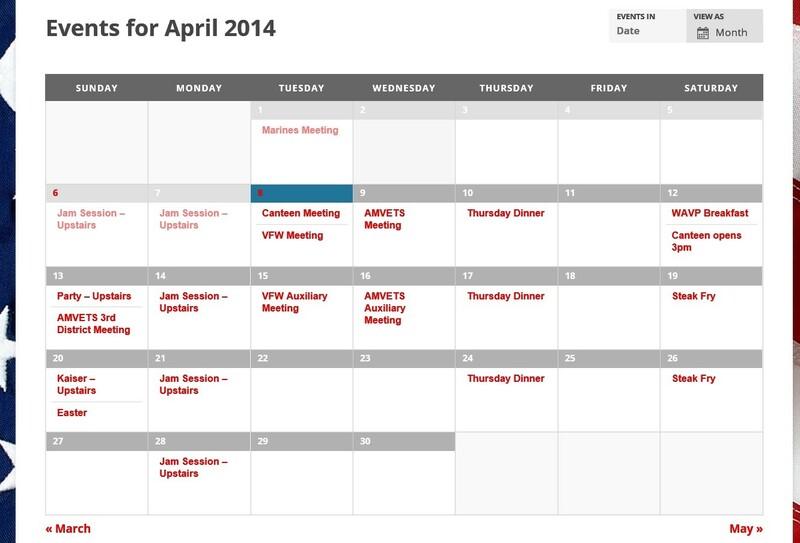 In our example below, we’ll look at the month of April, 2014. As you can see, all of the events are laid out in the calendar. 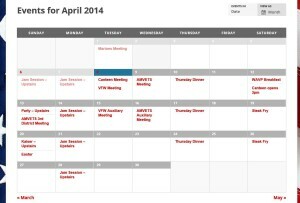 In this way we can see all of the events that are happening in the month of April. Now, let’s take a closer look at the 26th. By hovering our mouse over the event, we can see some of the details of this event. Additionally, we can click on the event, and see further details, such as the time of the event, where it’s held, who’s sponsoring the event and even who to contact. On the right hand side of the page, you’ll notice several items off to the side. This is called the Sidebar, and contains “snippets” of information called Widgets, some of which you can interact with, others are just on display. The first item on the sidebar is the search function. This will allow you to search for items on the AMVETS site that may interest you. The second item is a call to action by veterans to join the organization. Clicking the “Join Now” link will take you to the Membership page, allowing you to fill out an application and inform you how to pay dues. 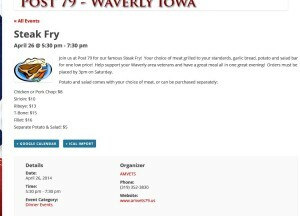 Below that is a short description of and a link to, the Waverly Area Veterans page. This page keeps members informed about topics like the new building and fund raising efforts. 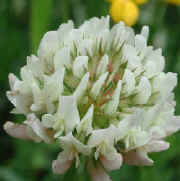 The next widget is an option to subscribe to the monthly newsletter. 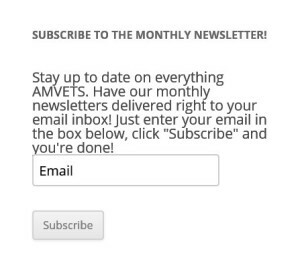 If you would like an emailed copy of the newsletter, simply place your email address in the box and click “Subscribe”. If you are already receiving an emailed newsletter, you will not need to sign up again. Below this are two widgets displaying the AMVETS national flower, which does nothing and the “Recent Announcements”, displaying the latest posts to the web site. The recent announcements are links which will take you to the original posts for you to read. Next is the calendar widget, which will let you know which days have events, and which don’t. 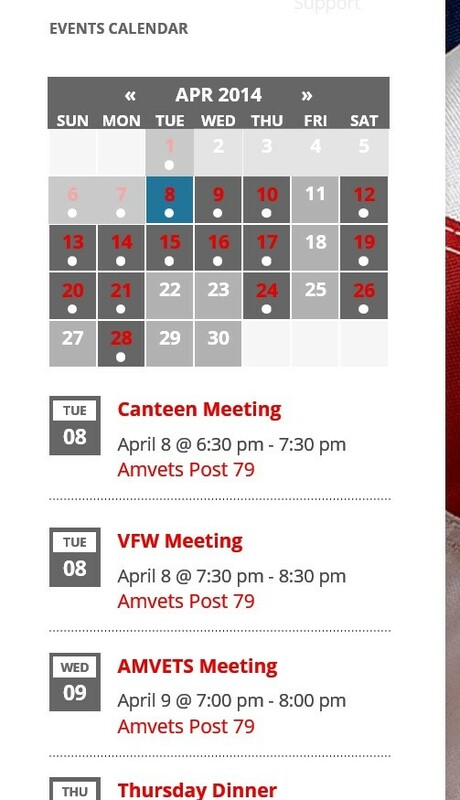 Days highlighted in red will let you know that something is happening on that day, while days listed in white have no events planned. Clicking on a day with an event will take you to that day and list the events below the calendar. If you have not clicked on any specific day, the next five events of the month will show up underneath the calendar instead. In this way, you can get a quick view of what’s happening at the AMVETS. Clicking on an event listed below the calendar will take you to the details of that event listing any additional information that has been entered regarding that event. The final item on the Sidebar is the Memorials. 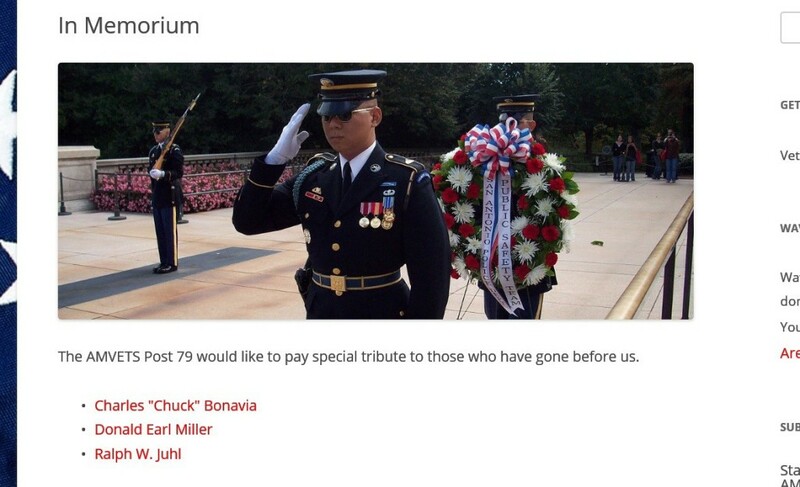 This will display the last five people listed in the “In Memorium” page. Clicking on any one of them will take you to their obituary. 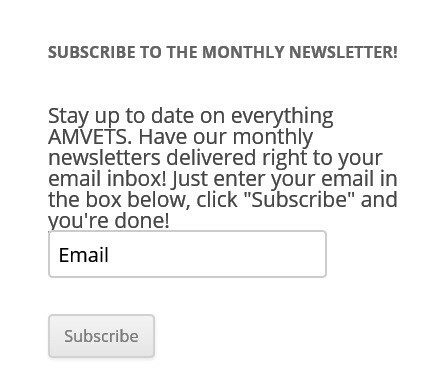 It is hoped that this tutorial has helped guide you through the use of the new AMVETS web site. If you have any questions that have not been answered here, please feel free to contact us using the form on the contacts page. Thank you for your continued support of the AMVETS and the Waverly Veterans!